Today is Throwback Thursday, so I'm going old school and sharing a link the way we used to do it back in the olden days before Facebook and Twitter. Going viral back then meant hundreds or thousands of people independently deciding to write about your blog post on the same day, or within a couple of days. It often killed your server, as the average $10 a month hosting plan back then couldn't handle thousands of people hitting the site at the same time. 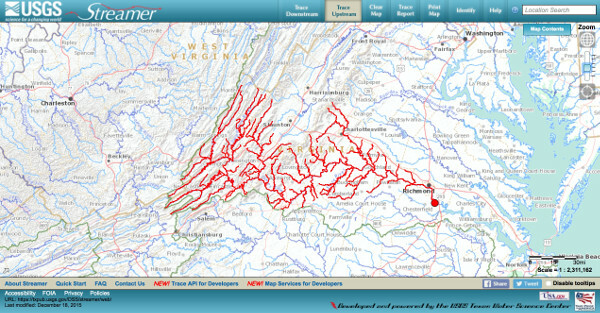 Trace A Stream is a US Government website that does exactly what it says on the can. You zoom in on a map, click on a stream, and it traces the water flow upstream to its source(s) or downstream to wherever the water ends up. It's kind of simple, but it's kind of cool. And the water source for the nearest river may just surprise you. HT: Fred First (Back in the golden age of blogs we had to manually acknowledge people who deserved acknowledgement. There were no retweets. It was a more civilized time. This is entry #6 in my attempt at 31 days of blogging for December 2018. I've haven't posted here daily since about 2007, so this should be interesting.